In this incredibly poignant memoir, Thrity Umrigar traces the arc of her Bombay childhood and adolescence—from her earliest memories growing up in a middle-class Parsi household to her eventual departure for the U.S. at age 21. Her emotionally charged scenes take an unflinching look at family issues once considered unspeakable—including intimate secrets, controversial political beliefs, and the consequences of parental discipline. Punishments and tempered hopes, struggles and small successes all weave together in this evocative, unforgettable coming-of-age tale. FIRST DARLING OF THE MORNING also offers readers a fascinating glimpse at the 1960s and ’70s Bombay of Umrigar’s memories. Two coming-of-age stories collide in this memoir—one of a small child, and one of a nation. 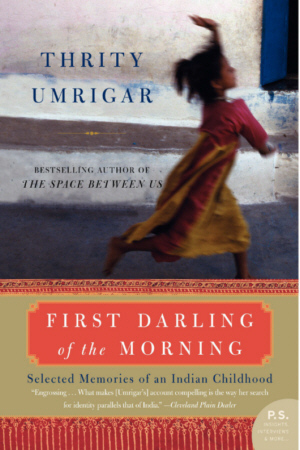 First published in book form by HarperCollins India in 2004, this is the first U.S. edition of FIRST DARLING OF THE MORNING.